Right now I’m doing two things at once. According to neuroscience, you can’t really multi-task, but if one task is fairly rote and the other complex, you can sort of do it in a muddled, chaotic way. First task: Take (say) the 26th photo out of the old album of black-and-white snapshots and faded color photos from my wedding. Put the 26th photo in my inexpensive flatbed scanner. Say out loud, “Number 26 is in the scanner” so I won’t forget by the time I name the file, because I can’t retain numbers in my memory very well. Close the scanner, click the button on the screen, and listen to the thin whine of the scanner. Name the file. Save it. Put the photo back in the album. Repeat. Second task: Recognize people I have known. Remember stories. Think about my own past, my husband’s past, my future. Make mental notes to ask my husband who the heck some of those people are. Wedding albums are valuable, not really to memorialize a ceremony or document that dress. No, weddings are when all sorts of people you know (friends, relatives, employers, and their friends and partners) intersect at one moment in your timeline, and you can see all of your relationships in that strange, vivid, awkward set of snapshots. I have been married 42 years. Thank you. Yes, it is a considerable achievement of compromise, patience, willingness to soldier on, mutual reinforcement, shared quirks, agreed-upon subjects for squabbling, fondness for cats, and intentional dissimilarity. But that’s not why I’m trying to scan in my wedding pictures right now. I have seen my wedding dress so many times. It was a Victorian-style creation with a high collar, lace trim, and a long train, which I bought on sale at J.C. Penneys. I don’t really care any more about the wedding dress, which my daughter wore for dress-up until we threw it out. Yes, my husband was adorable. Yes, it was a lovely day and our friend who played the fanfare trumpet looked excellent. It is the late 1970s in these pictures. The people in them had all been invited to my tiny, frugal, amiable wedding, and were somehow part of my life and my husband’s. The ceremony was at a church near my grandmother’s house where the reception was held, and was brisk, conventional, and straight out of the Episcopal Common Prayer Book. I repeat, the wedding is not the point of the wedding album. No, it was a crossing place for a hundred roads that intersected with my life, and the photos in the album are signposts with someone’s name on them. Each road came from somewhere and is going somewhere else. Right now I’m here trying to make a map from the sign. 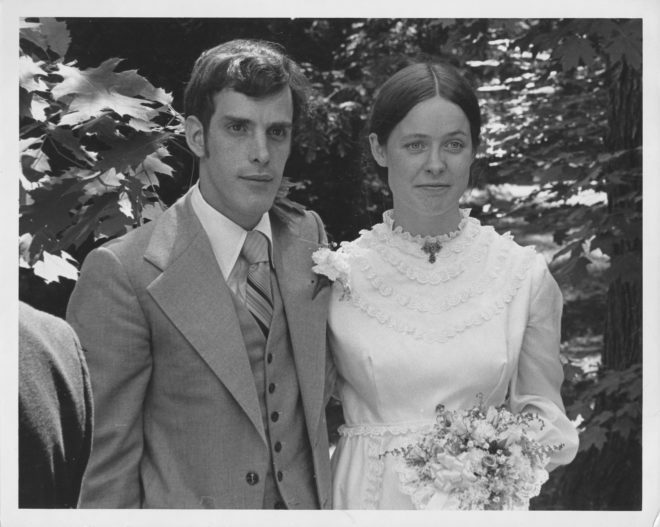 † Old wedding albums can point to a tangle of other intersections. For instance, that woman in the one picture was two years ahead of me in the small private girls’ school we went to, but she wasn’t attending because of that; she was there as the date of another friend, a guy we knew. That other guy there was a good friend, a realtor, who sold us our house seven years later (he’s dead now). A close friend we didn’t even know back then married the realtor’s daughter, but then they got divorced; the son-in-law came out and recently married his partner. We were invited to that recent wedding but couldn’t go because Stephen was in the hospital. So we’re not part of his wedding pictures. †† I’m uploading them all to Google Photos, where I will append descriptions identifying all the people once I’ve gotten my husband to tell me who they all are, ††† and share them with him so he can enjoy them if he wants. Then at some point I will move on. The point is not saving them. The point is experiencing them. The point is to enjoy the rich nostalgic feeling of realizing how I am connected to someone, from the serene privacy of my quiet study where I do not have to talk to anybody except the cats, who don’t expect me to explain myself. †††Update: My husband came home and identified people! Now I just can’t remember who that elderly lady is in the one picture, who was a friend of my grandmother’s. Oh, the joy!